Interview with the artist currently known as Usha. In the distance you hear the insistent and mesmerising rhythm of Zakir Hussain’s tablas drawing you irresistibly into the darkened gallery. On the far wall, a huge projection of swirling lights is ethereal in contrast to the throbbing pulse of Indian percussion that communicates directly to your body, inviting you to dance. "The Opposite of Illustration" is the title of a video that Usha Seejarim shot while traveling in a car at night. With a hand-held camcorder focussed on a shaky rearview mirror, she captured the headlights of oncoming cars weaving along the dark freeway. When projected and played at full volume, the work transforms the urban jungle into a paean to the world of spirit. Though of Gujerati origin and married to a Hindu, Seejarim has followed the Radhasoami Path of the Sikh guru, Master Gurinder Singh since he visited South Africa a few years ago. From this rich heritage, she has developed a belief system that is principled, disciplined and abstemious while encouraging delight in the physical world. Two-and-a-half hours a day are spent in meditation. A vegetarian diet is followed and alcohol and drugs are avoided. While this path of discovery has provided spiritual enlightenment, it has also ensured that her perceptions are unique and startling. When approached by the curators of an exhibition entitled ‘Self,’ she chose to make a four-and-a-half-metre long print of trucks. Why? Years ago she began photographing trucks after she came to see them as metaphors for the self and the burdens we carry. In her words, “a truck picks up a load, travels a journey, deposits the load and picks up another one. So too do human beings.” The observation translates into the Buddhist and Hindu philosophy where karma is carried from one situation to another or from a previous life to the next. There can be no action without consequence. While we all carry baggage, it is how we conduct the journey that distinguishes us one from the other and elevates our lives. “I identify more with the essence of rituals than with the activities. But at the same time I’m more interested in daily rituals like brushing one’s teeth or driving to work.” Commuting daily by bus between Lenasia and Doornfontein inspired the work for her exhibition, Long Distance, at the Generator Art Space in 1999. “I was intrigued by the fact that the same people use the same bus every day. The idea of gathering together and being together every morning was something very exciting for me,” she says. Many commuters play Thuni, a fast and exacting game of numbers that all too easily, like any game of skill, becomes an obsession. Indulging in another obsession of collecting, the artist produced large collaged patterns of ordered bus tickets that map the physical journey. By contrast, the photographs of the bus reflected in shop windows in which the artist’s image also appears, suggest that external reality may be illusionary or at least, transient. Since her undergraduate studies at the Witwatersrand Technikon, Usha has worked for the Curriculum Development Project and was gallery coordinator at Camouflage, one of Johannesburg’s hottest visual art venues that describes its activities with the words "Art. Culture. Politics" emblazoned across its threshold. Currently registered as a full-time student for a Masters in Fine Art at the University of the Witwatersrand, she also holds the position of assistant director of the Visual Arts and Crafts Academy where she is engaged in a teacher training programme that is focussed on educators of deaf and blind learners. Usha was recently selected for Fresh, a project that creates opportunities for young South African artists who are exploring new ways of making art. Funded by Marlene Dumas, who was herself a young artist in Cape Town before establishing an international career in Amsterdam, the project allows each artist to spend time working at the South African National Gallery creating a new work and producing a book. During her residency (19 March to 12 April 2001), she examined differences between her experiences of Johannesburg and Cape Town. One area of focus was the ocean. Seejarim articulates the purpose of the Radhasoami Path as being to recognise that we are part of a larger energy or love. Invoking the metaphor of a drop of water in the ocean, she explains her conception of humanity as being made up of separate beings who share in the nature of God. Her combination of wisdom, humanity and playfulness and her delight in the sensuous and the spiritual makes Usha Seejarim an artist to take note of. Look out for her book due to be published later this year. 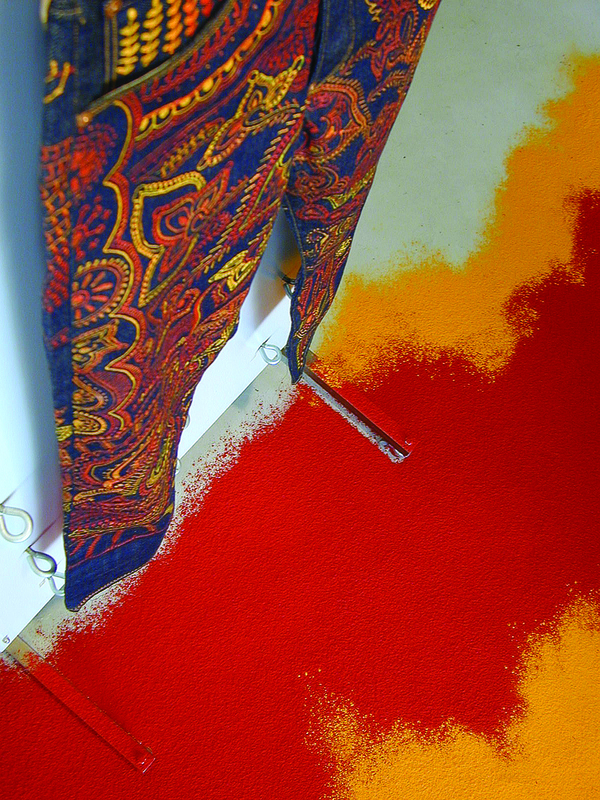 Levi’s Vintage Jeans, 2000 – 2001, fabric, paint, pigment, spice. 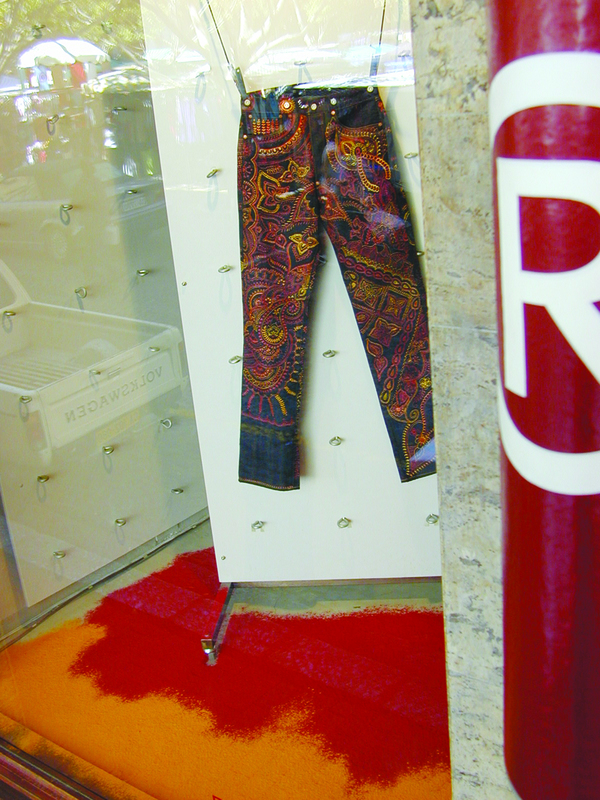 While this shop window illustrates Levi’s core values of individuality, ingenuity, rebelliousness and sexuality, the installation with customised Vintage jeans celebrates some of Usha Seejarim’s personal and cultural values. The pervasive aroma of pigment and spice, the richness of their colour, their tactility and above all their significance in her belief systems excite the artist and contribute to the heady experience of her work, which is both sensuous and spiritual.